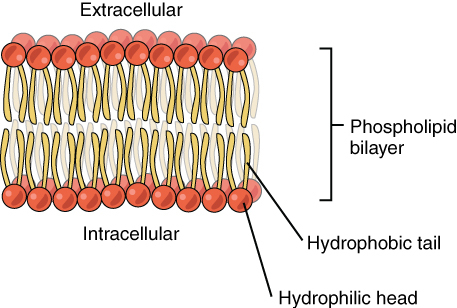 Phospholipids are amphipathic molecules that make up the bilayer of the plasma membrane and keep the membrane fluid. 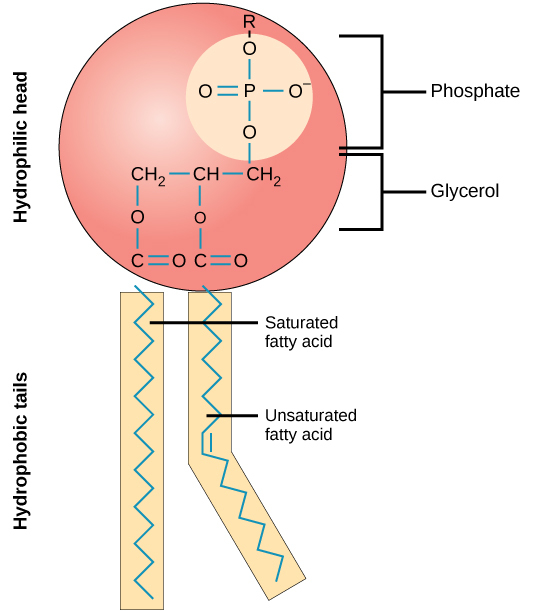 Phospholipids consist of a glycerol molecule, two fatty acids, and a phosphate group that is modified by an alcohol. The phosphate group is the negatively-charged polar head, which is hydrophilic. The fatty acid chains are the uncharged, nonpolar tails, which are hydrophobic. Since the tails are hydrophobic, they face the inside, away from the water and meet in the inner region of the membrane. Since the heads are hydrophilic, they face outward and are attracted to the intracellular and extracellular fluid. If phospholipids are placed in water, they form into micelles, which are lipid molecules that arrange themselves in a spherical form in aqueous solutions. micelle: Lipid molecules that arrange themselves in a spherical form in aqueous solutions. amphipathic: Describing a molecule, such as a detergent, which has both hydrophobic and hydrophilic groups. Phospholipid Molecule: A phospholipid is a molecule with two fatty acids and a modified phosphate group attached to a glycerol backbone. The phosphate may be modified by the addition of charged or polar chemical groups. Two chemical groups that may modify the phosphate, choline and serine, are shown here. Both choline and serine attach to the phosphate group at the position labeled R via the hydroxyl group indicated in green. Phospholipids are major components of the plasma membrane, the outermost layer of animal cells. Like fats, they are composed of fatty acid chains attached to a glycerol backbone. Unlike triglycerides, which have three fatty acids, phospholipids have two fatty acids that help form a diacylglycerol. The third carbon of the glycerol backbone is also occupied by a modified phosphate group. However, just a phosphate group attached to a diacylglycerol does not qualify as a phospholipid. This would be considered a phosphatidate (diacylglycerol 3-phosphate), the precursor to phospholipids. To qualify as a phospholipid, the phosphate group should be modified by an alcohol. Phosphatidylcholine and phosphatidylserine are examples of two important phospholipids that are found in plasma membranes. A phospholipid is an amphipathic molecule which means it has both a hydrophobic and a hydrophilic component. A single phospholipid molecule has a phosphate group on one end, called the “head,” and two side-by-side chains of fatty acids that make up the lipid “tails.” The phosphate group is negatively charged, making the head polar and hydrophilic, or “water loving.” The phosphate heads are thus attracted to the water molecules in their environment. The lipid tails, on the other hand, are uncharged, nonpolar, and hydrophobic, or “water fearing.” A hydrophobic molecule repels and is repelled by water. Some lipid tails consist of saturated fatty acids and some contain unsaturated fatty acids. This combination adds to the fluidity of the tails that are constantly in motion. The cell membrane consists of two adjacent layers of phospholipids, which form a bilayer. The fatty acid tails of phospholipids face inside, away from water, whereas the phosphate heads face the outward aqueous side. Since the heads face outward, one layer is exposed to the interior of the cell and one layer is exposed to the exterior. As the phosphate groups are polar and hydrophilic, they are attracted to water in the intracellular fluid. Because of the phospholipds’ chemical and physical characteristics, the lipid bilayer acts as a semipermeable membrane; only lipophilic solutes can easily pass the phospholipd bilayer. As a result, there are two distinct aqueous compartments on each side of the membrane. This separation is essential for many biological functions, including cell communication and metabolism. 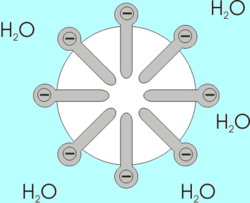 Micelles: An example of micelles in water. A cell’s plasma membrane contain proteins and other lipids (such as cholesterol) within the phospholipid bilayer. Biological membranes remain fluid because of the unsaturated hydrophobic tails, which prevent phospholipid molecules from packing together and forming a solid. If a drop of phospholipids is placed in water, the phospholipids spontaneously form a structure known as a micelle, with their hydrophilic heads oriented toward the water. Micelles are lipid molecules that arrange themselves in a spherical form in aqueous solution. The formation of a micelle is a response to the amphipathic nature of fatty acids, meaning that they contain both hydrophilic and hydrophobic regions.